(L-R) are Gary Seybold, vice president of OME dealers and special accounts, and Ravi Saligram, CEO, both of Ritchie Bros.; Michael Vazquez, vice president of Meco Miami; and Jake Lawson, group senior vice president of USA East, Ritchie Bros.
Senior members of the Ritchie Bros. leadership team recently visited Meco Miami ahead of the annual Florida Auctions. Gary Seybold, vice president of OME dealers and special accounts, and Jake Lawson, group senior vice president of USA East, both of Ritchie Bros., visited Meco Miami in the past, but it was the first visit for Ravi Saligram, CEO of Ritchie Bros.
Michael Vazquez, vice president of Meco Miami, said the Ritchie Bros. officials were interested in seeing the company's inventory so they could prepare accordingly for the Ritchie Bros. sale in Orlando this coming February, which will feature some of Meco Miami's equipment. Vazquez and his team were happy to give Ritchie Bros. a tour of their facility and discuss the upcoming auction. During the tour, Vazquez explained the company's business model and also discussed its reconditioning services for equipment. “By selling off this lot of used equipment, we will have the opportunity to offer our customers newer equipment,” said Vazquez. 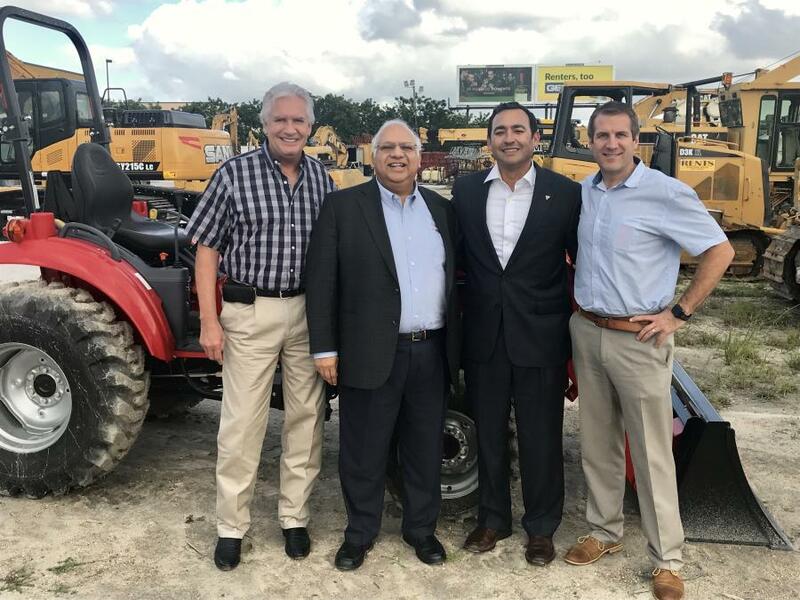 Meco Miami is the authorized distributor of Atlas Copco, Dynapac and Sany heavy equipment and Mahindra tractors & UTVs in South Florida, serving the industry for more than 40 years. We offer new and used equipment to meet your business needs. Dynapac compactors for road building projects are available for rent and new Sany excavators at reduced rates are available for purchase or leasing. Meco Miami works with the best equipment in the industry. Its expanded fleet of construction equipment enables the company to offer a more complete line of well maintained used equipment for contractors seeking equipment rental in Miami-Dade, Broward and Palm Beach county. New Dynapac rollers also are available for rent or purchase, with financing available. Meco Miami is committed to the local and worldwide demand for construction and demolition equipment. For more than 40 years, the company has served the industry with quality equipment and parts.